Do You Know the Way to San Miguel? Yep! B efore you can enjoy the magic of San Miguel, you have to get to San Miguel. 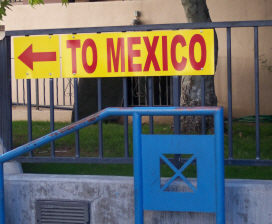 Fortunately, travel to Mexico isn't hard. Yes, getting to San Miguel de Allende is harder than, say popping over the border to Tijuana, jetting off to Cancun, or even flying into Mexico City or Guadalajara. And we're glad it takes just a little more effort to travel to San Miguel. You really have to want to be here. And that makes you the kind of folks we want to see. But visiting San Miguel is getting easier all the time. Roads have been improved. New airports are opening, offering more options for both departure and arrival. Long-distance bus lines add more routes and—especially nice—more comfortable "executive class" services. You have more choices—and much more comfortable choices—than you did just a few years ago. I think over the years I have traveled to San Miguel via every form of transport available. (Well, I've never actually ridden in on a horse or a burro as the famous Stirling Dickinson apparently did back in the 1940s. And I've never walked in.) But I've come by plane, by bus, by car, and by train (sadly, no longer an option). To travel to Mexico, most people will fly nowadays. For San Miguel, flights to Mexico can deliver you to León (1 1/2 hours away by car) and now also to Querétaro (about an hour away). Many others chose to drive to Mexico, generally crossing the border at or near Laredo or McAllen, Texas. San Miguel de Allende is a pleasant drive of about nine hours from the border, with good toll roads most all the way. Some do it in one long day, others break the trip overnight in Matahuala, Saltillo or San Luis Potosí. Another way to get to San Miguel de Allende is by bus. No, don't run away screaming. Long-distance Mexican buses are nothing like you probably expect. Don't think Greyhound. Think wide, cushy reclining seats like a first-class airline seat, think on-board video, coffee, a snack, clean bathrooms. On an Ejecutivo class Mexican bus, you'll travel to San Miguel in far greater comfort than you imagined. For specific information on all the different options for how to get to San Miguel de Allende, click on the links below. Just get here! Obviously the easiest and fastest way to travel to Mexico—and the quickest way to San Miguel—is by air. There are a few options for doing that. This page will help you decide which is the best choice for your flight to Mexico. Driving into Mexico and on to San Miguel de Allende can be a good option if you plan to stay awhile. You'll have a car available for day trips out of town or runs out to the hot springs. And you can bring stuff! Here's how to get to San Miguel by car. Traveling by long distance bus to San Miguel can save you money and give you a completely new look at Mexican culture. It's surprisingly comfortable too! Here's how to take a bus to San Miguel.